63 Innovation Nuggets (for aspiring innovators) are derived from the real life, practical experiences of George E. L. Barbees corporate world experience45 years, across 40 countries. He's has successful entrepreneurial experiences (founded 3 companies) and has lead innovation with Fortune 100 companies like Gillette, General Electric, PepsiCo, IBM, and PricewaterhouseCoopers. Barbee broadens the c… oncept of innovation from the historically narrow view around new products emanating just from R&D. Instead, today's innovation emanates from a diverse array of individuals across a wide range of functional areas including finance, technology, manufacturing, marketing, engineering, and sales. His innovative global leadership is wide ranging across consumer products, entrepreneurial financial services, and global professional services.Barbee's experience convinces him that most of us have an innovative spark that can be ignited. Being innovative is personally rewarding and can add great value to any organization. 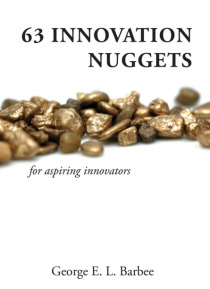 Innovation is all around us, and using these nuggets can help improve observation skills, transfer skills, and many others.The analogy to panning for gold nuggets is intriguing. Pioneering prospectors would sort through and collect individual pieces. At first each individual nugget may appear to have minimal value, but the total collection takes on the greatest wealth.